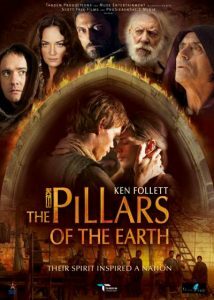 The Pillars of the Earth tells the story of Philip, prior of Kingsbridge, a devout and resourceful monk driven to build the greatest Gothic cathedral the world has known . . . of Tom, the mason who becomes his architect - a man divided in his soul . . . of the beautiful, elusive Lady Aliena, haunted by a secret shame . . . and of a struggle between good and evil that will turn church against state and brother against brother. The Pillars of the Earth was an eight-part 2010 TV miniseries. It debuted in the U.S. on Starz and in Canada on The Movie Network/Movie Central on July 23, 2010. In 2011, the series was nominated for 3 Golden Globes, including Best Mini-Series or Motion Picture Made for Television, Ian McShane for Best Actor and Hayley Atwell for Best Actress at the 68th Annual Golden Globe Awards. If you like Pillars of the Earth by Ken Follett, try these other historical-fiction tales of the medieval world. After surviving a vicious attack on his village in 1343 A.D., archer Thomas of Hookton joins the army of King Edward III as he prepares to launch an invasion into France, but his quest for vengeance takes him on an epic quest for the Holy Grail. A medieval illuminator with radical views finds himself sharing quarters with a widow struggling to preserve her independence in this enthralling historical novel set in the 14th century, a time of religious strife. Lady Kathryn, mistress of Blackingham Manor in East Anglia, must be practical to ensure the future of her 15-year-old twin sons. Isabella, Queen of England, has been dispatched to France in an attempt to bring about peace between the two countries, and Baldwin must accompany her. But the day after their arrival, a servant is found murdered, with Baldwin's dagger lying next to the body. As Baldwin struggles to prove his innocence, the killer strikes again. With so many English enemies gathering in Paris, will Baldwin be able to expose the culprit in time to protect the English? In London of 1384, Crispin Guest is a disgraced knight, living on his wits, who turns to private investigations to support himself. His current case involves a merchant who suspects his wife of adultery, and is then murdered in a sealed room locked from the inside. View more suggestions for The Pillars of the Earth.